This was a first edition and he may have done revisions over time. You’ll note in the pictures that this book came with a vinyl sound sheet, unfortunately, I don’t have a turn table to play it on. 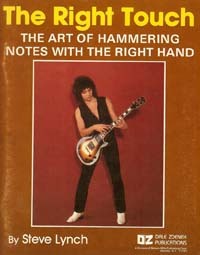 For the time it was published, this book covered a lot of two handed tapping. 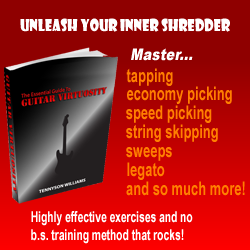 It starts with how to tap properly, and then goes right into pentatonic box shaped, scales using right index hammer, Pull off to left hand, then left hand hammer. I practice these to this day. Next, he does what I call a “stacked pentatonic”, where you play the same boxed shape a 4th above the original, playing two scales simultaneously. For example, take your typical Am box shape in fifth position with your left hand, then in tenth position, start by tapping the shape one note at a time and pulling off to the left hand note (Low E 10-5, 13-8…A 10-5, 12-7…D A 10-5, 12-7…etc) It sounds musical enough, but the example only gives you a G major chord to play it over. It would be nice if there was a chord progression listed to apply this technique. Bending and hammering notes is the next chapter and he doesn’t spend a lot of time on that for good reason, you can experiment to your heart’s content. He’s just showing you what can be done, it’s up to you to incorporate your own licks. Next, intervals are covered 3rd’, 4th, 5th, 6th, 7th and octave intervals are covered. I found two things a bit confusing in this section. First, before he gets into tapping the intervals with the right hand, he has diagrams of where these intervals are using the shortest distance possible in the diagrams (Major 3rd would look like the two lowest notes of and open G chord). Some examples are high to low, some are low to high. The first diagram goes from the 2nd fret to the 13th fret and across all strings. Now I’ve looked this over quite a bit, for the first example (Major 3rd interval) is the interval from left hand to right hand? No…that’s a 4th. Is the interval on the left hand from string to string? Yes, but as far as I can tell, it’s only the first two notes. Maybe it’s explained better on the recording, but I have no clue as to what these diagrams have to do with intervals. My second point of confusion is that a good portion of the notes to be hammered, cover the fret markers in the diagram. It would have been easier just to put a number above the fret board diagram to show what fret you’re working with rather than cover it with a box, circle or diamond. Next arpeggios are covered. I spent a great deal of time playing all these shapes 4 times every day for an entire month. It’s good for your ear and he covers lots of different arp’s, from standard Major chords to Augmented with three examples of each and what chords they’ll work against. Chord inversions and third’s harmony are covered followed by fret board tricks. The chord inversion section is set up the same way as the arpeggios in that they cover a lot of ground. The thirds harmony section has only three examples, but if you got through the previous two section, you can probably explore all kinds of different shapes at this point. 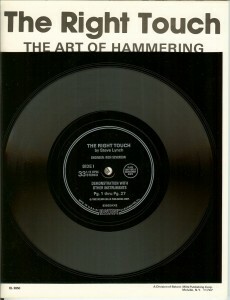 Overall, this was an excellent starting point for two handed tapping.